Our Super Heroes and Super People Reading Clubs are this Saturday, and we have a few spots open for those who can swoop in and sign up before 3pm tomorrow! If all the spots are filled, keep checking back since we may have cancellations today and tomorrow. If you had signed up but can't make it after all, please be sure to cancel online before 3pm tomorrow to open your spot for someone else. Or, find Rachel at Los Angeles Elementary School during this Saturday's June 14th Reading Clubs or at El Cholo afterwards. Send your questions to Rachel at Rachel.Harter readingtokids.org. In honor of Father's Day, through this Sunday, June 15th, Amazon Smile will also donate an extra $5 to us when you purchase an eligible item. 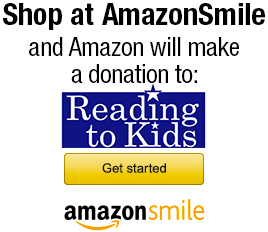 All you have to do is choose Reading to Kids as your charity when you log on. Click here for easy directions on how to start using Amazon Smile! Last night we had a fabulous time playing Legendary Bingo! Our supporters once again sold out the wonderful Hamburger Mary's, and we sincerely thank Jeffrey (aka Bingo Boy), and Roxy Wood for putting on a terrifically outrageous show. Thank you to all of our bingo players and to our wonderful prize donors, including Disneyland, Six Flags Magic Mountain, Conaco, Sony Pictures Television, CBS Television Distribution, Jake's Cafe and Billiards, MOCA, Tommy's, Archipelago Botanicals, Yogaworks, Gaiam, Salsa Bar Restaurant, Fleming Entertainment Centers, Inc, Gaylord Sports Management, Cohn Winery, SpeedZone Los Angeles, In-N-Out Burger, LA Philharmonic, Hollywood Wax Museum, Guinness World Records Museum, and the Queen Mary. Because of their support, a wonderful time was had by all! Thanks, and we hope to see you Saturday and at Dodger Stadium! - Thank You Bingo Players!